I don’t know if I’ve touched on this subject recently, but I’m really picky when it comes to facial and body cleansers. I know, like me, everyone has their favorites and they rarely stray from them, but I’m always testing new products so when I find a new cleanser that works for me and that I’m excited about I HAVE to tell you guys all about it. Olay’s new Cleansing Infusion line is my new obsession and I guarantee once you try these 2 new products they’ll be a favorite of yours too. Olay’s Micropolishing Cleansing Infusion Hydrating Glow Facial Cleanser with Crushed Ginger and Citrus Extract and Olay’s Microscrubbing Cleansing Infusion Hydrating Glow Body Wash with Crushed Ginger contain exfoliators that break down as you wash that create a micropolishing effect that reveals a smooth surface for healthy looking and feeling skin! Plus the scent…amazing! I’m a huge fan of ginger, and this crushed ginger scent is subtle, but sweet. I’m not someone who likes very strong smelling cleansers, especially on my face, so this is perfect for me. I’ve been using Olay’s Cleansing Infusion line for about a week now and I can already see a difference. I’m usually not that confident with my skin in the very early spring because I’m SOOOO pale and it can look a little dry and ashy because of the harsh Winter weather, but I’ve quickly learned that when your skin is exfoliated and hydrated it glows and reflects light better than any highlighter or summer tan can! So I challenge you to take the #TiltTest! 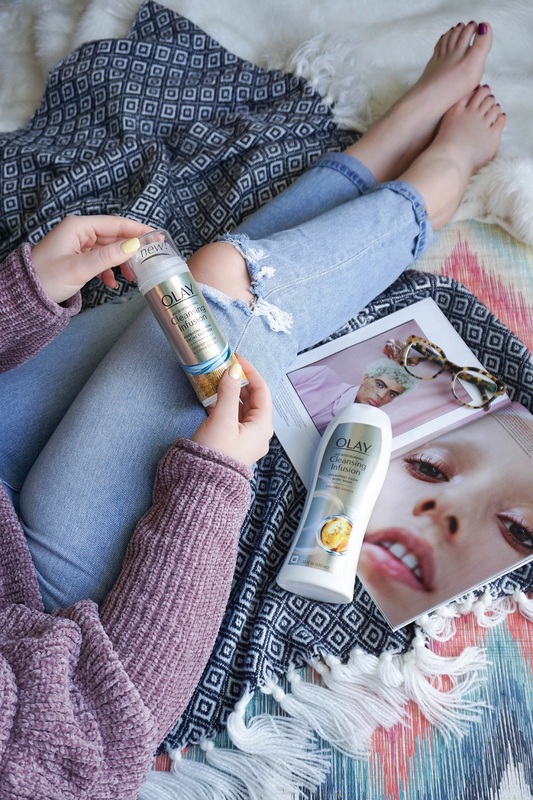 Try Olay’s Cleansing Infusion for a week then tilt your face, legs, shoulders and arms into the light, catching it to show off the natural glow. Micropolishing my skin has definitely changed my dull winter skin to glowing Spring skin! I’m micropolishing my skin this Spring…what about you? Purchase the entire Olay Cleansing Infusion Line at your local Giant Food Store Retailer! For coupons, click here!